I just finished your book Lessons from the Ledge in 2 hours...what a journey! I am changed. Isn't it just like God to give an unexpected gift when you least expect it. The hard-learned lessons you share throughout the book on guilt, forgiveness, grief, self-love and joy are life-changing. You didn't spiritualize everything, yet God's hand was woven into every page. Your true, honest and very "real" story is a tragedy turned into a triumph for you, your children and for anyone who reads this book. Your "mess" is now your "message" and one that the world definitely needs to hear. It is my honor to endorse your book, Nancy. Thank you for sharing this gift with me! With unflinching candor, Nancy Nelson shares her complex story of grief and loss. Unable to protect her children from the pain and sorrow brought on by her soon-to-be ex husband's suicide, she must dig deep spiritually in her journey from shock to healing. Anyone who has suffered loss will relate to this book. In particular, widowed moms will benefit from Nelson's honesty and wisdom. For anyone who is trying to deal with tragedy, grief and loss, Lessons From the Ledge provides hope and encouragement that there is a way to heal, forgive, and regain control of life. It is a book that you can't put down. The honesty and truth in Nancy Jo Nelson's writing is not only inspirational but will touch your heart and leave you feeling emboldened. Her story is truly unbelievable. This book will help those (especially women) struggling with tragedy, the effects of addiction on the family, relationships and grief to find a sense of peace and optimism through the darkness. Nancy Jo Nelson shares her journey dealing with and overcoming a horrible tragedy that could have left her hopeless. 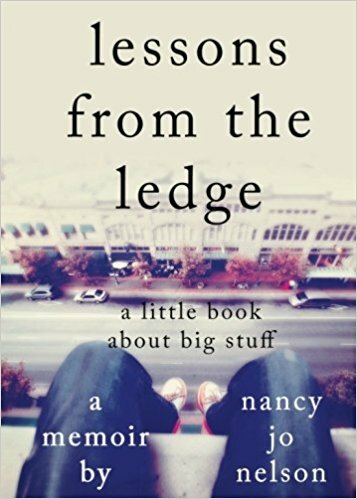 Nancy Nelson's Lessons from the Ledge takes us on her journey through a tragedy that no one would want to experience. Through her raw, transparent and authentic writing we walk through her experience with her, learning how to navigate our own life-ledge moments. So honored and thrilled to write this for you! God, I'm so proud!